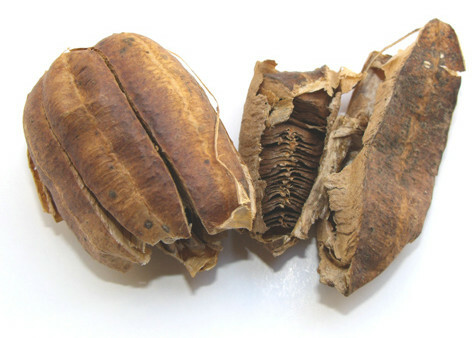 The dry ripe fruit of botan-lianoid plant Aristolochia contorta Bge. or A. debilis Sieb.et Zucc. of family Aristolochiaceae. The Aristolochia contorta Bge. from northeast of China and Hebei province in China, the A. debilis Sieb. et Zucc. from Jiangsu, Anhui and Zhejiang provinces and so on in China. Collect in autumn when the color of fruit turns into yellow. Special smell, slightly bitter taste. 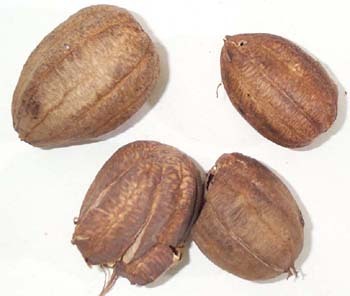 Dry, oval, intact, yellowish green, without impurities, no worm eaten and without mildew. Dried in the sun; unprocessed or stir-baked with honey. Bitter, slightly pungent, cold; lung and large intestine meridians entered. Clear lung heat and resolve phlegm, stop cough and relieve dyspnea. Being bitter, cold and with descending characteristics, it can clear lung heat, resolve phlegm and stop cough and dyspnea. So it is good at treating phlegm, cough and dyspnea due to lung heat. For cough due to lung heat with symptoms of profuse phlegm and dyspnea, it is often combined with lung-purging and heat-clearing herbs and qi-directing downward and phlegm-resolving herbs, such as Sang Bai Pi, Huang Qin and Ku Xing Ren and so on. For dryness cough due to lung heat and fluid consumption, it is often combined with yin-tonifying herbs and phlegm-resolving and cough-stopping herbs, such as Mai Dong, Tian Hua Fen and Zhe Bei Mu and so on. With the actions of clearing lung heat and directing qi downward and stopping cough and relieving dyspnea, it is often combined with yin-tonifying, dryness-moistening and lung-clearing herbs, such as E Jiao to treat lung yin deficiency cough with symptoms of chronic cough, less phlegm, dryness of throat or bloody phlegm. In addition, large intestine heat is removed after lung heat has been cleared, because lung and large intestine are interior-exteriorly related. So this herb can clear excess heat of large intestine to treat swelling pain or bleeding of hemorrhoids due to heat congestion of large intestine. Decoct 3~10g. Take proper dose for external application. Decoct fluid for fumigate washing. It should be stir-baked with honey for chronic cough due to lung deficiency. Being bitter and cold, it should be used with cautions for cough and dyspnea due to cold deficiency or diarrhea due to spleen deficiency. Proper dose should be used to prevent vomiting. Recent year's research showed that aristolochic acid has strong renal toxicity, so it should be used for nephritis or renal inadequacy patients.